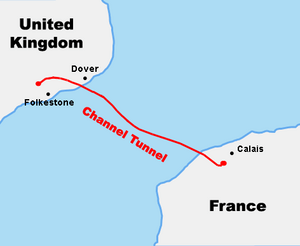 The Channel Tunnel (or Chunnel) (French: le tunnel sous la Manche) is a long underwater tunnel between England and France that runs under the English Channel at the Strait of Dover. It is only for trains. Some of the trains in the Channel Tunnel carry freight, including automobiles. Others, like the Eurostar, carry only passengers. The tunnel, which was once called the Eurotunnel, opened in 1994. It is 50 km (31 miles) long and its deepest point is 75 m (250 feet) beneath the surface. 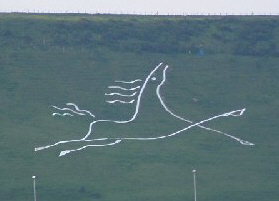 It connects Folkestone, Kent in the United Kingdom to Calais in northern France. This has reduced travel time between London and Paris to a little over two hours with high-speed trains. Interior of the Eurotunnel Shuttle, used to carry motor vehicles through the Channel Tunnel (cars are unable to be driven through it) between its two termini. This shuttle is the largest railway wagon in the world. Channel Tunnel Facts for Kids. Kiddle Encyclopedia.